Good morning, Dear Reader. Well, it’s morning here and it’s probably morning somewhere else, so “Good morning” even if it’s afternoon or evening or the witching hour where you are now reading this. I hate to split hairs, especially my own. Several weeks ago my husband and I made a pilgrimage to Montgomery, Alabama, my husband’s “tierra” as he occasionally called it. The city where his mom went to high school. Where his grandmother might have known Zelda Fitzgerald, known well enough to nod “Good morning” if they happened to pass on the street. But they came from different social classes and, besides, his grandmother did not “approve” of Zelda so they would not have been friends. I digress. On the way home from our mini-excursion, we stopped by a mini-Grand Canyon near Lumpkin, Georgia, about two hours drive from our home. We’ve lived here in this region of the South for 25 years and yet we had never visited this child-size gorge. We’d heard about it, had friends who drove up here to take day hikes through the gorge, but we remained fairly oblivious of this little nugget of nature so close to us. 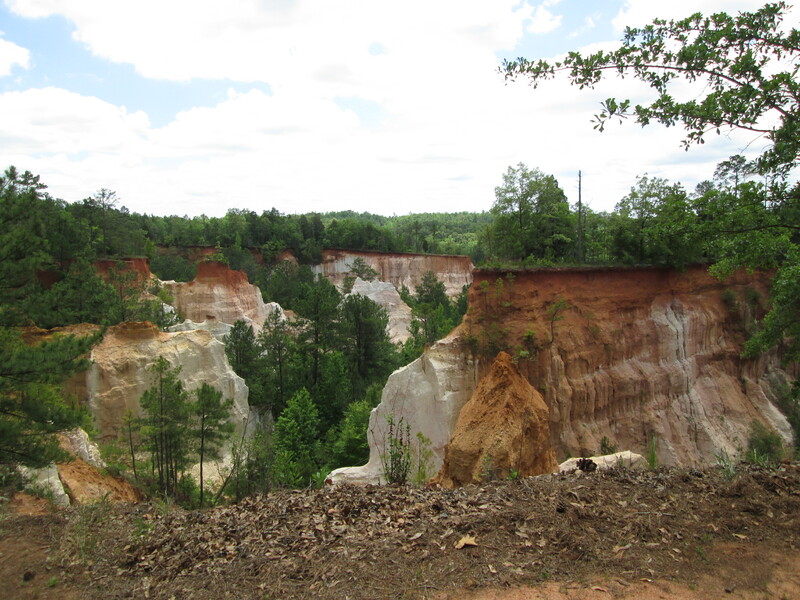 It’s called Providence Canyon and without further adieu, here are some photos for your viewing pleasure. Yes, that’s the back of my husband. That’s probably about as much of him as you all will ever see. He’s not shy. He’s just anti-social media. The Visitor’s Center was closed so we just followed signs down to the floor of the canyon. I wasn’t really dressed for a hike. At least my shoes weren’t hiking boots and we had only one bottle of water between us. And it was hot! We were perplexed by all the trees and foliage that obscured the bluffs. 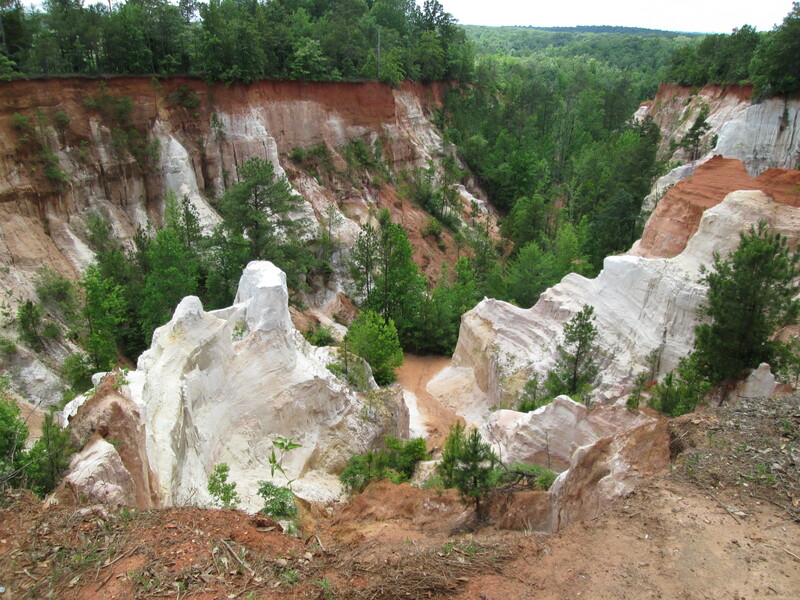 Frankly, we started to wonder why our friends had made such a fuss over Providence Canyon. It wasn’t until we were leaving the park and saw some picnic tables down a wide expanse of lawn. At the far side of the lawn, we were greeted with these views. Granted, Providence is not as impressive as the Grand Canyon, but my husband saw stargazing opportunities here. Naturally the best spot for stargazing would have been further out on the bluff, past the fence and danger sign. No way will I let him do that. 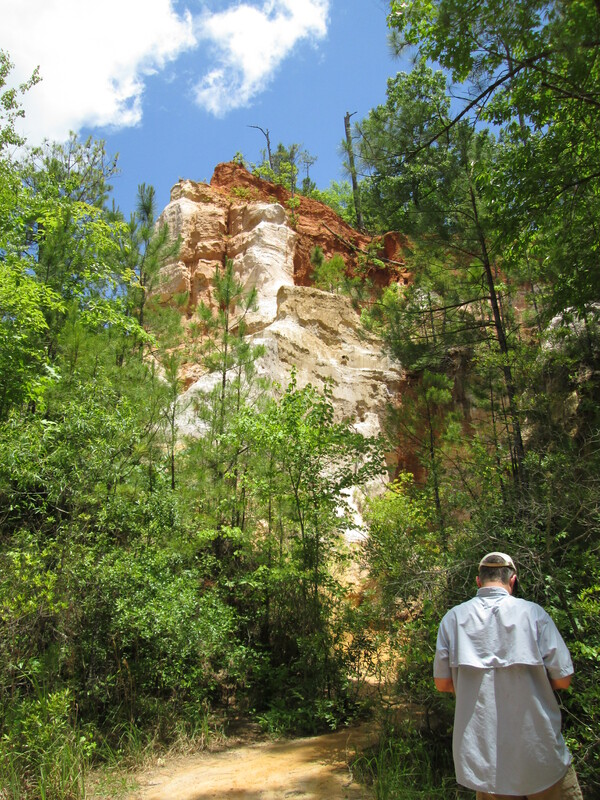 This entry was posted in Nature and tagged Georgia, Grand Canyon, hiking, Lumpkin, mini-wonders, natural beauty, Providence Canyon, Zelda Fitzgerald. Bookmark the permalink. Beautiful place. Looks like a fun trip was had. When I was younger it was not so grown up. It looked more like the Grand Canyon. I wonder if they planted those trees to stop erosion. Young people used to lover’s lane over there. Funny to see all the pine trees so tall. Makes me feel really, really old. Glad you enjoyed it, Peter! Beautiful bit of your backyard, Marie! Love the contrasting colors. Very striking. I agree. 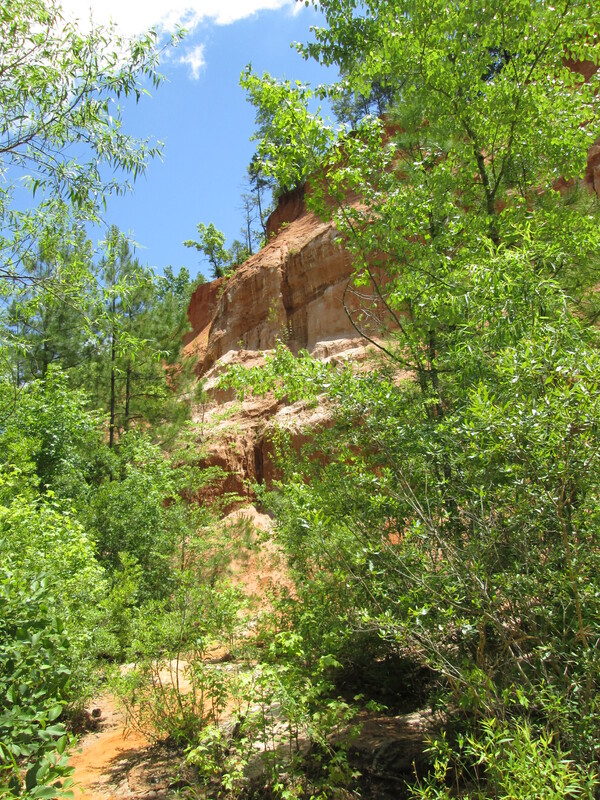 I love the contrast of the green leaves of the trees with the red clay of the bluffs. Thanks for taking me along. Looks like a peaceful place. 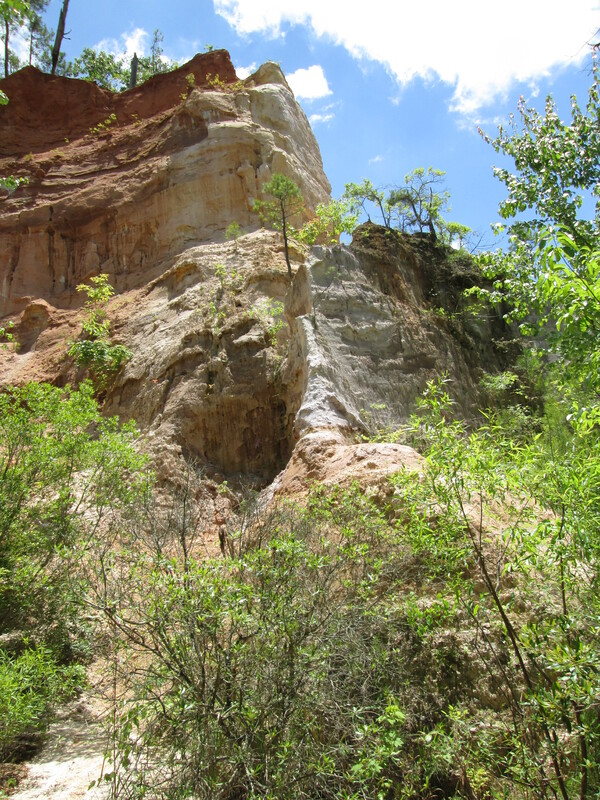 Beautiful, Always fun to find hidden hiking treasures not far from home. Thanks for sharing your photos. How pretty! Look at all the wonders in this country!!! Georgia has another gorge in its northeast corner. I’d love to visit Providence sometime. OMG, this is in Georgia? Who would have thunk. It’s beautiful. I also love how hot it looks down there (sorry, can’t help it: I’m almost always cold in Alaska, even in the summer). Oh, indeed it’s hot all right. It’s the humidity that kills you though. I prefer the dry heat of the west. 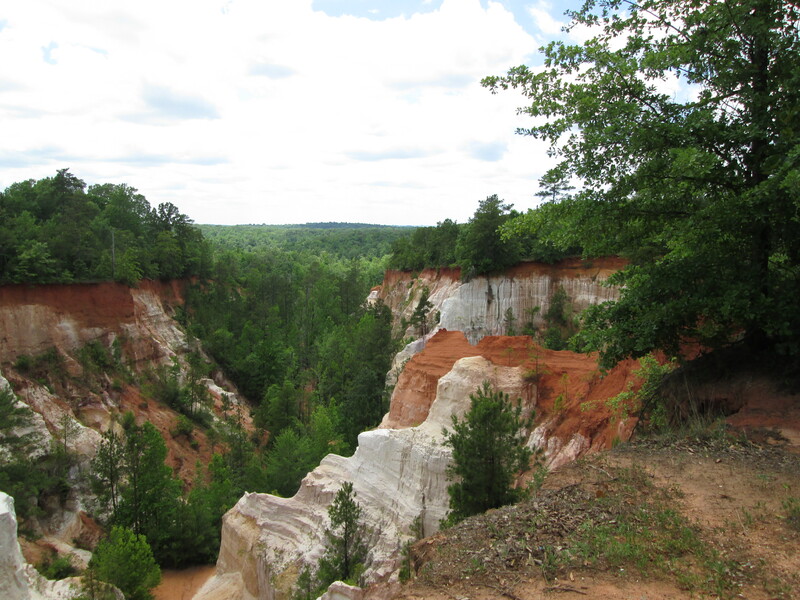 But, yes, Providence Canyon is beautiful and I hope we might go back up for a hike sometime. “Anti-social media”I like it! 🙂 Looks like a lovely spot. I have been reading Harper Lee’s latest and been feeling almost transported to your husband’s “tierra”. Will you write a review of Lee’s book for your blog? I’d love to know what you think of it!